So the brightly colored, delectable smelling party that is LUSH (created by Mark Constantine and Liz Weir) has been going strong since 1995. At that time I was addicted and dedicated to another product line and could not be swayed. But as my concern for our environment, our animals and our planet has exponentially increased over the last several years...LUSH has landed smack dab on my radar! I feel particularly concerned about the amount of materials companies continue to use to package their merchandise. Plastic wrappers around tubes of product, that are then boxed, then sealed again with a much harder plastic...ridiculous! It's a problem, one that LUSH has been addressing for years with their innovative solid beauty products. Sold like produce at an open market, with ingredients and aromas to heighten the luxury. Today I shine a light on their artful shampoo bars. Long lasting, concentrated, packed with active ingredients and essential oils (with 14 different flavors to choose)...and will do the job of 2-3 bottles of liquid shampoo! No packaging whatsoever, it sits in a soap dish on the side of the tub. Perfect. Lather. Rinse. Repeat. The bars last for up to 80 washes for lavish locks every time. LUSH products are 100% vegan. LUSH are against animal testing and are supporters of animal rights and welfare. 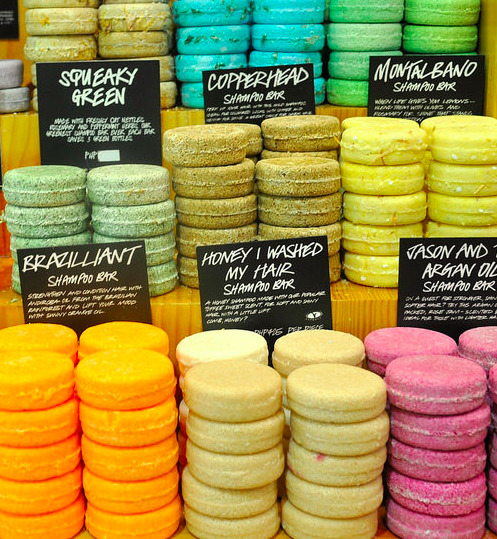 LUSH are charitable and support environmental conservation and human rights. LUSH works tirelessly to leave a small carbon footprint behind.